Create, Converse, Connect – Speak Well. 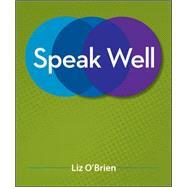 Liz O'Brien teaches students that to speak well is to speak responsibly, confidently, and authentically--to create well-researched and constructed speeches, and to converse, and connect with their audience. Through Speak Well's listener-centered approach to public speaking, one in which the speaker engages in a vibrant conversation with listeners rather than giving a static performance, students learn that their primary purpose as speakers is to communicate ideas. The result is reduced student anxiety about speech delivery, increased self-assurance, and more authentic, successful speeches. In an easy-to-use handbook format, Speak Well guides students through the many choices that speakers must make when crafting and supporting a message, while a series of interactive speech preparation tools and an McGraw-Hill's proven adaptive learning system, LearnSmart, helps them master key course concepts, practice, build confidence, and achieve success in public speaking.